This beautiful headpiece is the easiest way to add a finishing touch to your costume. 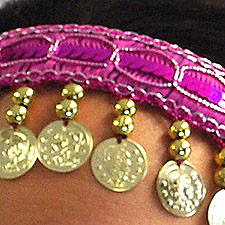 This beautiful dark pink / fuchsia headpiece is the easiest way to add a finishing touch to your Belly Dance costume. Sequins, ornate edging, beads, and coins adorn a flexible plastic headband base which is comfortable to wear for hours. A new classic that is a must-have for every belly dancer's wardrobe! Suitable for all styles of belly dance, for men, women and children. Also great for cosplay, harem / genie costumes, gypsy costumes, Halloween, masquerade, parties, stage productions and more.